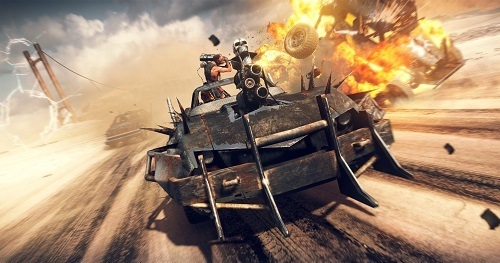 Mad Max drives the world of the franchise right into the video game arena. Available for console and computer systems alike you’ll explore the deadly post-apocalyptic wasteland on your quest for revenge in this battered environment. Your character is the patrol officer Max Rockatansky who does his best to forage off the wasteland and survive amongst the various warlord led gangs who are constantly fighting for resources, stealing from those unable to defend themselves. During an expedition to the Plains of Silence for fuel Mac encounters Scabrous Scrotus who pushes Max off the roadside with the help of his War Boys. Leaving him to die on the in the middle of nowhere and taking his supplies Max beings his journey for revenge with Chumbucket as he builds the ultimate car, the Magnum Opus. 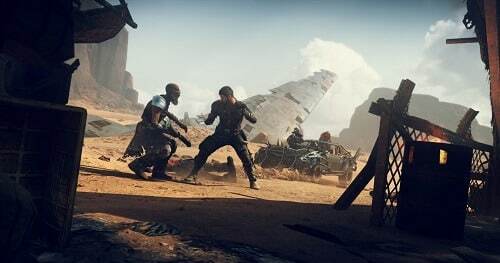 With its post apocalyptic setting and wide landscapes Mad Max revolves heavily around scavenging items and car based combat which makes up over half of the games content. Upgrading both Max and his car are central to the story as you increase your stats, unlock weapons and equip your car with all manner of deadly weapons. This ties in well with the exploration emphasis of the game with players driving across the wasteland for parts to add to the Opus Magnum. The majority of these have trade offs to consider though which allows players to craft a vehicle that suits their preferred driving style. Outside of his car Max is just as deadly with combat mostly involving boxing like moves and a small number of fire arms. Max is equally as customisable as his car from appearance to skills, weapons and abilities. With the expansive landscapes of deserts, caves and canyons spread across the abandoned wastelands there are also a number of other side activities to engage in during your Mad Max adventure. Tasks such as time trials, races, fortress invasions and conveys can help players in weakening a regions threat level before clearing it entirely of enemies. Explore the wasteland as you scavenge for supplies. Build and customise the Opus Magnum vehicle. Beat enemies with boxing and wrestling moves to conserve ammo. Plenty of vehicle combat and races to engage in. Conquer territories and upgrade Max as you explore.